YetiSports 1 is a great-looking but very simple game that’s probably not worth a penny more than the $1 that it costs. For the Birds: The Level mode in YetiSports 1 tries to add some variety to the mix, but the game still falls a little short. Do you remember that Web game that was popular a couple years ago, where you swung a bat at just the right time to smack a penguin just as far as you could? That game, Pingu Throw, lives on, now on your iPhone or iPod touch. The sole goal remains the same: As the Yeti, swing your bat to perfect Pingu the Penguin’s arc, aiming to blast him across ever-greater distances. Visually, Root9 MediaLab’s YetiSports is a slam dunk. The sky, the backgrounds, the birds, and, of course, the Yeti himself are all drawn beautifully. Animations are smooth. Even the menus are elegantly designed, and a pleasure to interact with. As far as gameplay is concerned, though, YetiSports feels sorely lacking. The developers get credit for extra effort—they’ve added a second game mode, a multi-touch interface, and more—but all those extras feel decidedly tacked-on, and don’t add much in the way of fun or replay value. 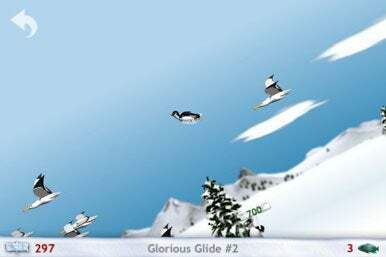 In “classic” game mode, your sole goal is to whack the penguin as far as you can. You tap to “launch” the penguin and tap a second time to swing. Beyond the timing of that swing, the only control you can exert over the game is by tilting the iPhone from side to side. Doing so adjusts the penguin’s coasting, and can maximize the distance you travel. But frankly, while I tilted my iPhone this way and that, I didn’t notice that I was having too much impact. Certainly, the tilting has an effect; it’s just that effect is too minimal to feel satisfying. “Level” mode adds one a few small twists that make YetiSports a bit more fun, although that’s not saying much. Other birds are added to the mix, and you aim to grab the fish those birds are holding in their mouths as you glide the penguin along. The birds can also provide some bonus lift to help you keep the penguin airborne longer. If you collect the right number of fish, you advance to another level. Once again, however, YetiSports falls short: The levels are repetitive, and virtually indistinguishable. So while coasting is more fun in Level mode, and the games can last a little longer because of it, it’s still a very limited game. To further the disappointment, the sounds in YetiSports pale dramatically in comparison to the visuals. The too-cute sound effects get repetitive even faster than the monotonous gameplay, which is a truly ignominious accomplishment. Yeti Sports takes a few seconds to learn. And it takes about a minute to play. But sadly, it also takes just three or four minutes to experience completely. After those minutes, there’s nothing left to discover, and the penguin smacking becomes nothing more than a trivial novelty. YetiSports 1 is compatible with any iPhone or iPod touch running the iPhone 2.2 software update.